← Mini Crab Cakes- Your next “Go-To” Appetizer. Mike here – I’m typically the one to take on the cooking projects that involve building something or a long process that yields something worth waiting for. Cold-smoked salmon really fits the bill here. Here’s how I use a little ingenuity to turn a fresh piece of fish into the most delicious smoked treat. 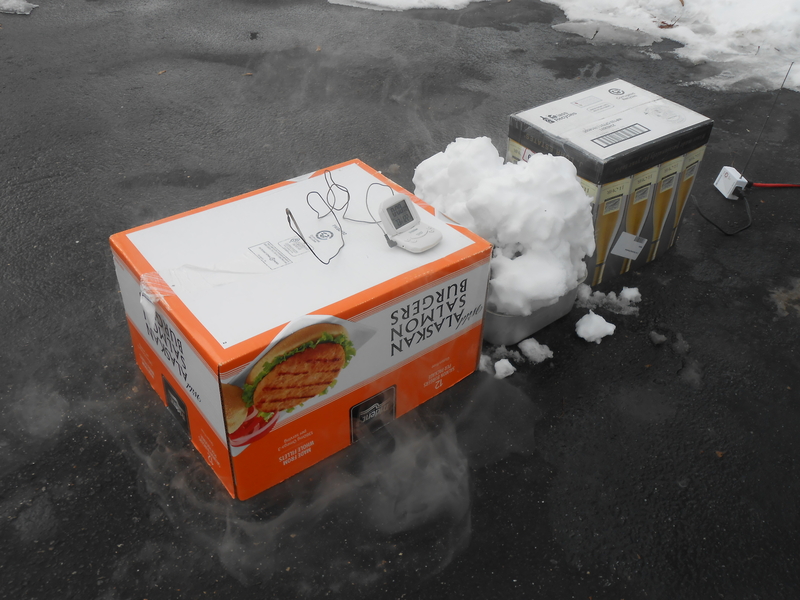 Cold-smoking means exposing food to smoke at temperatures lower than what would “cook” it. For salmon, this means smoking below 90F. Also, since it’s not cooked or dried, it gets cured prior to smoking, to make it safe and ready to eat cold. First, the cure: Mix up 1 cup kosher salt , 1/2 cup sugar, 1/2 cup brown sugar, and a tablespoon fresh ground pepper into a bowl. 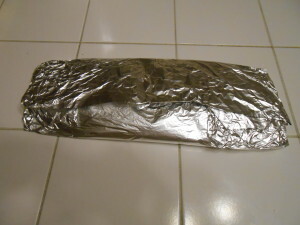 Lay down a large sheet of aluminum foil, cover it with a few layers of plastic wrap, and spread about half of the mixture on top. Lay down a nice large piece of salmon on top. This one is about 3 pounds. It is also skinless, which makes it easier to deal with. Ask your fishmonger to skin it for you. You can use a few smaller fillets to make up the 3 pounds, if you can’t get one this large. 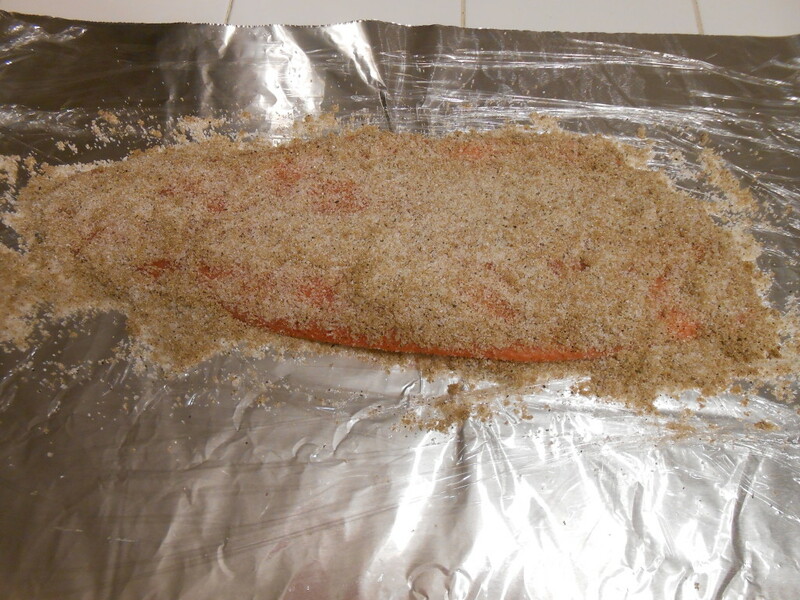 Cover the salmon with the rest of the salt/sugar mixture. If using multiple pieces, do it in layers, with mixture in between each. 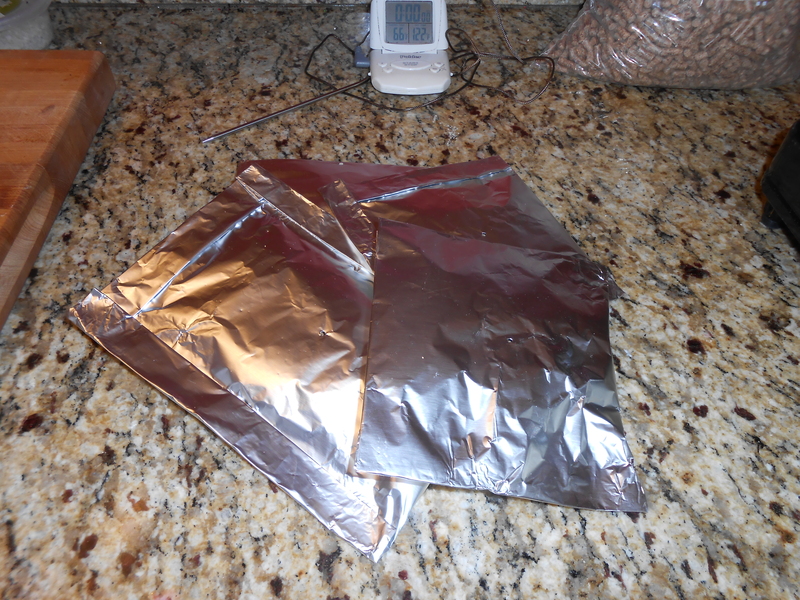 Next, roll the plastic wrap tightly over the fish, the the aluminum foil, to make a tight package. Place it in the refrigerator on a baking sheet or on top of some paper towels, as it may leak. Put something heavy on top to weigh it down, maybe a dish of leftovers you already have in there, or a phone book. 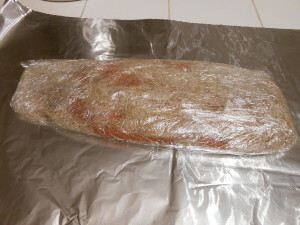 Turn the wrapped fish over after about 12 hours, then leave it in the fridge for another 12 hours. Remove the fish and rinse it thoroughly under cold water. At this point, we basically have lox. It should be fully cured and somewhat firm-feeling. If you’re not sure, cut it in half and make sure the cure has gone all the way through. If left in the cure too long, the ends will get very firm and almost jerky-like. Still good, but the dry texture would limit the applications. You could sample some now, or slice thin and put some on a bagel – but it’ll be more awesome if it’s smoked. You can also wrap it up in plastic, put it in the fridge, and smoke it the next day if the timing is more convenient that way. 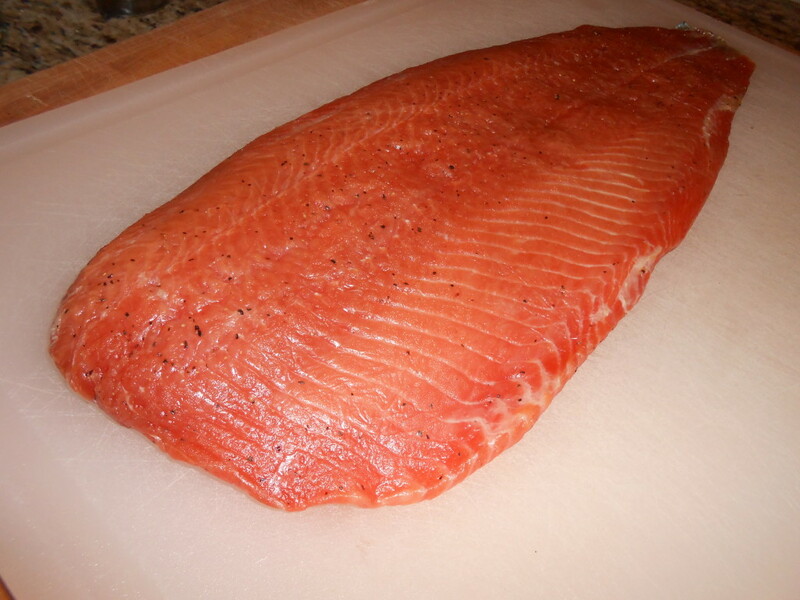 Make sure the salmon surface is nice and dry before smoking – the smoke “sticks” better that way. I construct my cold-smoker out of 2 cardboard boxes connected by a pipe or two. A cheap hot plate goes under one box and heats the wood to create smoke. 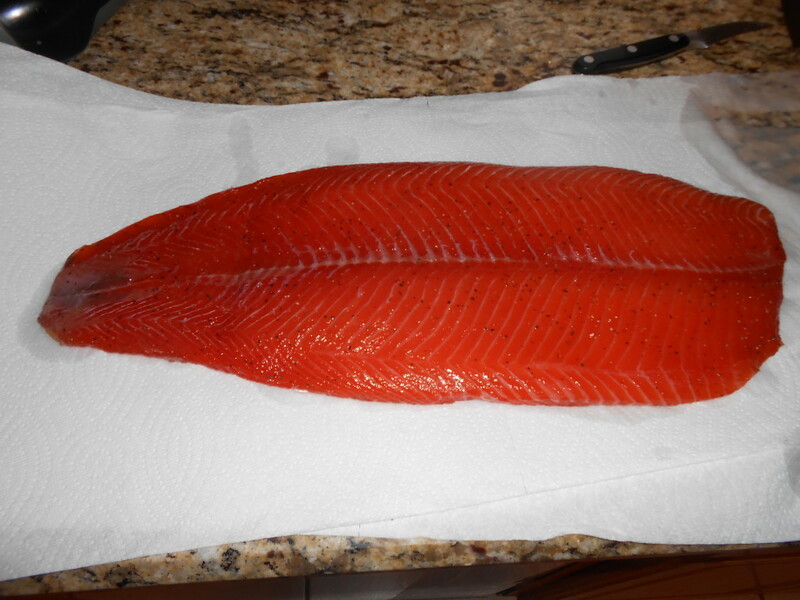 The salmon is placed on a rack in the second box. The temperature differential creates an air current that moves the smoke down the pipe to the second box where it wafts over the salmon. The two-box method is more forgiving temperature-wise than one large box, because it allows the smoke to cool and keeps the fish physically separated from the high heat of the hot plate. Use whatever you have – For the grate, I use a large grill basket overturned, so the salmon is elevated and gets lots of circulation. Tape up the cardboard boxes to seal any air gaps. The pipe should be about 2-3″ diameter. PVC will work, metal is better. I once hacked off an 18″ section from an extra lally column and it worked great. 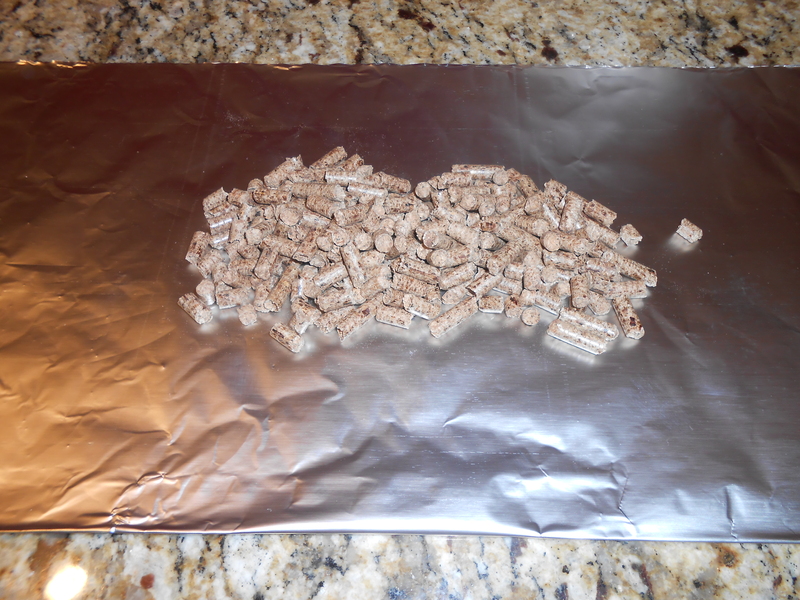 I’m using pecan wood pellets. Pecan wood gives the salmon a distinct sweet nutty flavor. Smoking with pellets is a little different than with chips. The pellets need to be sealed in an airtight heatproof container otherwise they would quickly combust in acrid flames instead of let out their sweet smoke. 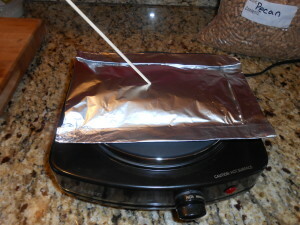 I put a handful onto a double-sheet of heavy aluminum foil, seal it up into a tight pouch, then poke a very small hole in the center with a wooden skewer to let the smoke out. Keep the hole small, it if is too big, oxygen will get in and the pellets will quickly burn up. If using chips, you can soak them in water for an hour and put handfuls into an aluminum pie plate. 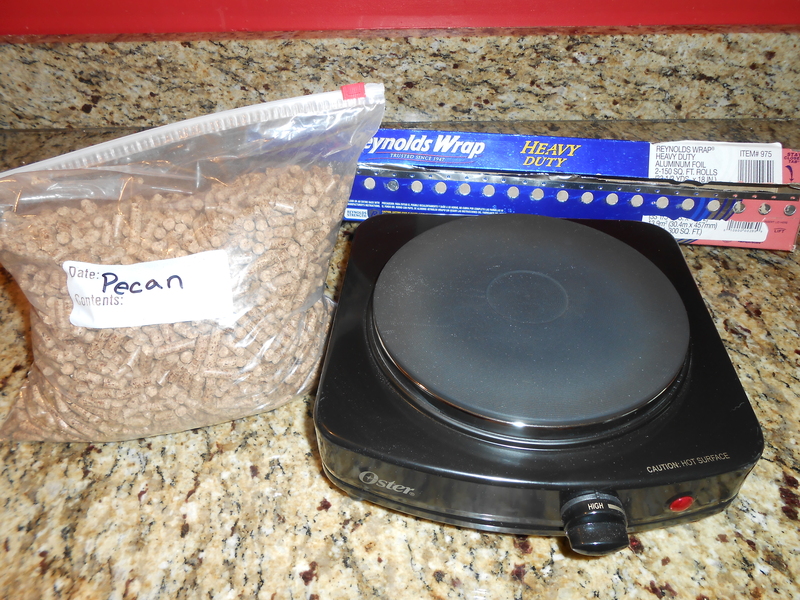 I don’t have a preference on chips vs pellets, but I only had pecan wood in pellets. A packet of pellets lasts up to an hour. Make up a bunch of them so they’re ready to use once one runs out. Now take everything outside. Don’t smoke in the house! 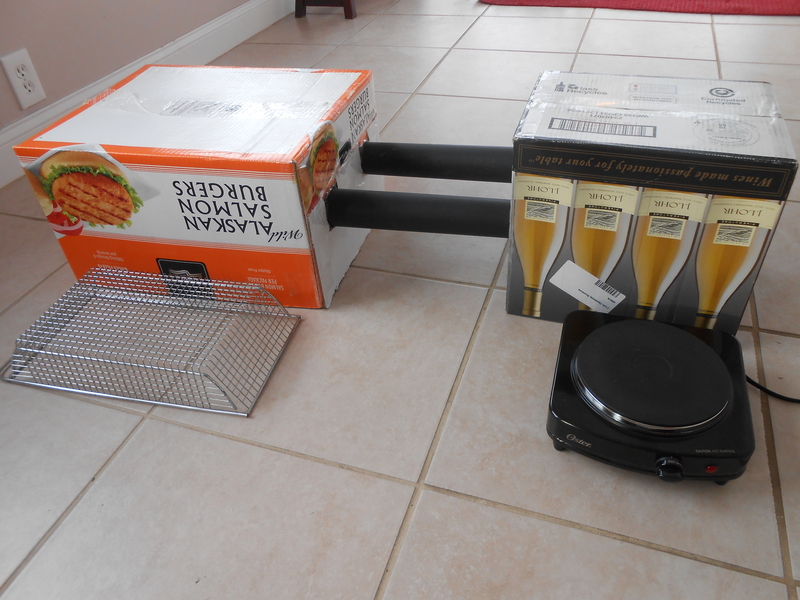 Put the packet of pellets on the hot plate turned on high, salmon on the rack, then place the boxes over both. Temperature control is important here. I use an electronic kitchen thermometer poked into the top of the salmon box to monitor the air temp inside. Target is below 90F. 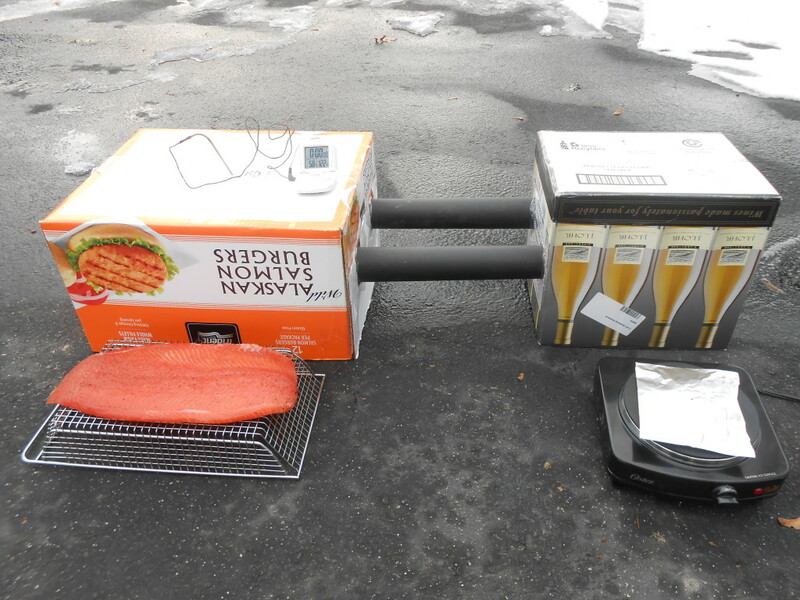 If it’s cold enough outside (at or below freezing), you may not have to do anything to keep the salmon box cool. We also don’t want to be lifting the hot plate box all the time, so I use a few tricks. This is a remote controlled plug-in switch that I got from X10.com for free during a promotion about 10 years ago. 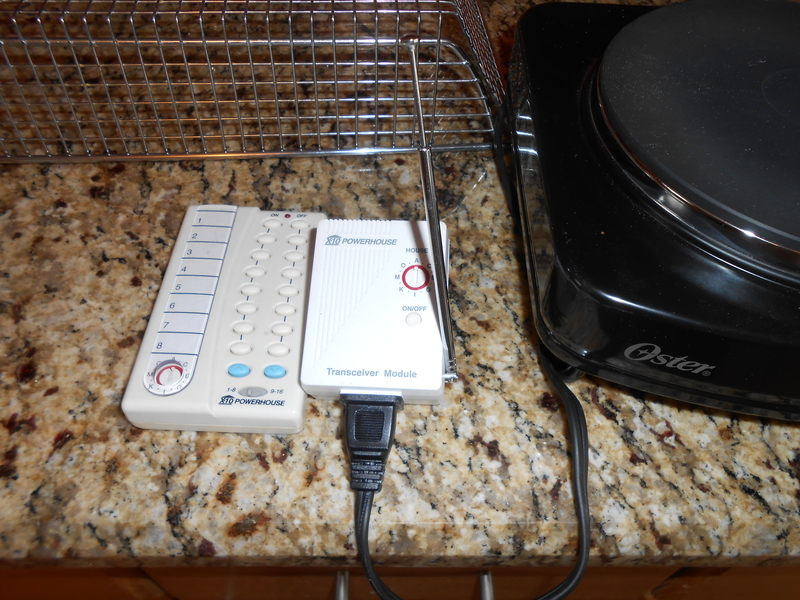 I plug the hot plate into this and can turn it on, off and even use the ‘dimmer’ function to adjust the heat without even going outside! I also cool the pipes by packing with snow or ice cubes. This does a great job of cooling the smoke as it makes its way to the salmon. It takes a few minutes for the smoke to get going, but once it does, you’ll see it escaping from the bottom of the salmon box and the whole neighborhood starts smelling awesome. Peek out the window at it every so often. If the temperature is too hot, turn off the plate – the wood will keep smoking for a while. Add more wood once you stop seeing smoke coming out of the box. Smoke for as long as you can stand. I usually have about 5 to 8 hours to let it smoke. Pull it out of the smoker, behold the rich smokey aroma, and notice that it looks pretty much the same as it went in, just with a darker brownish hue from the smoke (that the little point-n-shoot camera isn’t capturing well). Slice on the extreme bias with a very sharp knife, for thin supple slices. Try not to eat them all before you serve them up. These would be great on toasts, with sour cream, or just by itself. I’m not sure how long this would keep in the refrigerator, because it’s so good I haven’t had it around long. I’d guess at least a week. 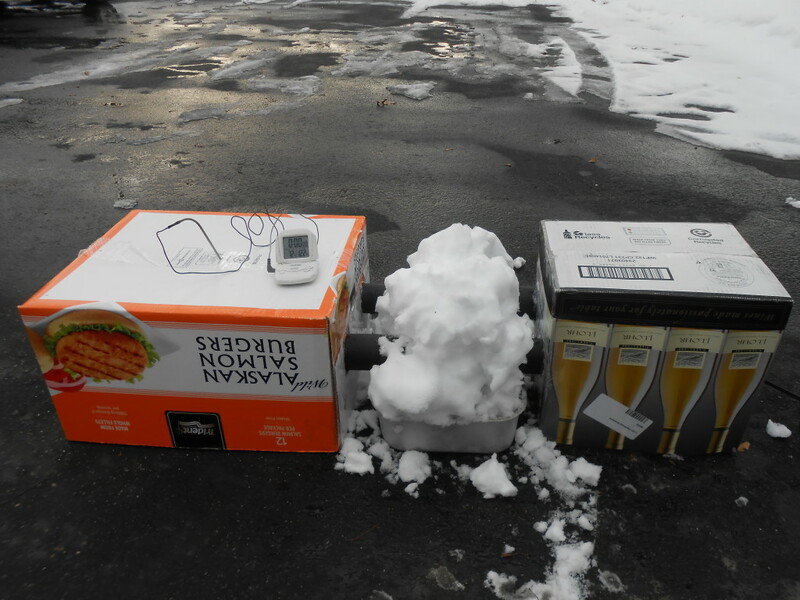 If you live in weather where it is hotter than 80F outside, you will likely need to further improvise to keep your smoker cold enough – and let me know what you did! If I tried this in the summer I’d either make some sort of ice-rack rig or hook up a spare window A/C unit to circulate cool air. Spread half of the salf/sugar mixture on the plastic wrap in the shape of the salmon. Place salmon on top of the mixture and top with remaining mixture. If using multiple fillets, make sure every surface of fish is covered in the mixture. Tightly wrap with the plastic and foil. Cure in the refrigerator for 12 hours. Turn over and cure for another 12 hours. Unwrap and rinse thoroughly with cold water. Dry thoroughly. Cold-smoke fish for 5 to 8 hours. 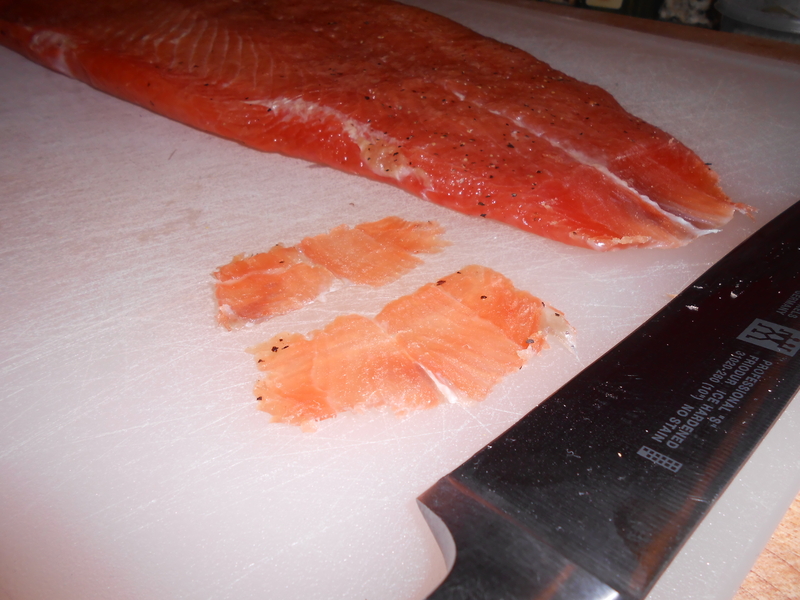 This entry was posted in Cooking, Guest Posts and tagged cold smoke, diy, salmon, smoked salmon. Bookmark the permalink. Making my first round of lox today using this recipe, only I substituted the kosher salt for sel gris, using a touch more to compensate for the difference in.grain size. Had it curing over night for the alotted 12 hours. Used only 1 lb filet as im the only one that will be eating it. I tried it with the cheaper “never frozen” Atlantic salmon you done at most major grocers. It is a bit farrier than most of the higher end salmon, so.i am concerned about the fishiness. It is currently drying in the fridge to form a pellicle and then I’ll be cold smoking it tonight. Tasted it right after the cure and man, it was pretty tasty! Not as fishy as I was worried about. Thanks for the share! I like your idea for the cold smoker. As I live in an apartment in central Wisconsin I am thinking of giving it a try since we can’t seem to source proper lox here; not that I can afford those prices anyway but do have fresh salmon. Thank you for your recipe snd ideas. I live in the southern us and Had to make some modifications to the smoker setup to deal with temps in the upper 80’s. I elevated a rack with some 2×4’s and loaded the fish box up with ice. Works great! The ice keeps the temps below 90 for about 2-3 hours. I stuck a couple thermometers through the fish box and reload ice as needed. As far as the recipe goes, the fish turned out great but was a bit to salty for my taste. Currently testing a similar recipe using a brine that I’ve used for hot smoked salmon. 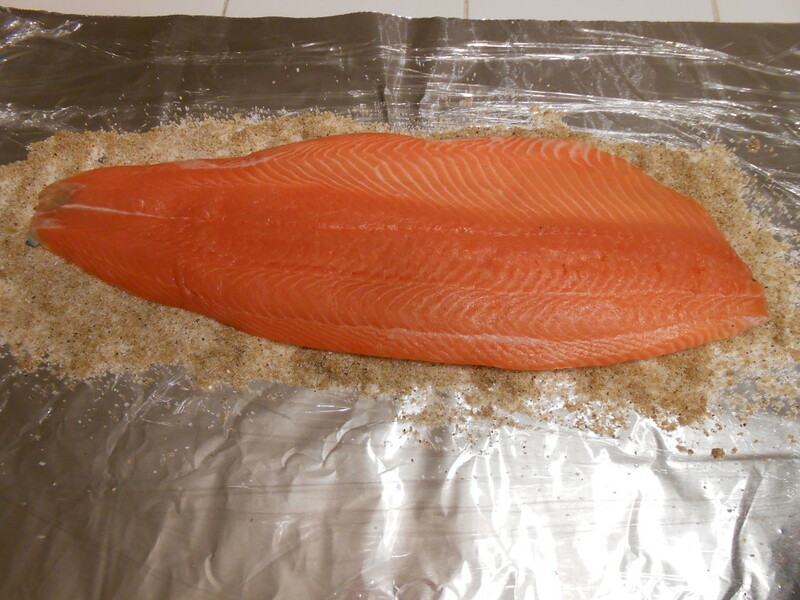 I have a nice side of salmon curing, and was wondering if I could use my Smoking Gun to fill a sealed container (Thinking an ice chest since it would hold a LOT of smoke.) with smoke and smoke my salmon that way. There would be zero heat generated this way, and I can re-add smoke at any time in just a few seconds. I could even smoke my salmon using this method indoors! I guess my real concern is whether some heat is actually required to get the proper finished product, or if smoking with zero heat is safe and effective. Thanks, and below is a link to the Smoking Gun that I have, in case you haven’t seen one before. Sounds interesting! No heat is needed. I imagine this would work. Let me know how it turns out. Is it safe to use plastic pipe ? I’ve used plastic pipe. Just don’t let it get too close to the heating element and it will be fine. I just run into your artical and love the idea of smoking my own fish. I ‘ ve done meat on a larger scale with a friend on his larger unit. ( 4′ x 4 x 6’ ) and had great sucess.I’m anxious to make my own smoker soon out of 1/8″ aluminum. Do you think I will have a hard time controlling the heat? I think controlling the heat depends what you are using as a heat source. I have a propane vertical smoker which does great for hot-smoking anything (meats, fish, etc) and can get hot enough to double as an extra oven. But in warm months it gets way too hot to cold-smoke with it even with the vents open. With the flame on its lowest setting the box stays around 180 degrees. That’s why I like the electric element for cold-smoking because it’s a lot easier to adjust or cycle on/off. Recently I needed to add some quick smoke to some meat I was going to cook later and I didn’t have any proper chips on hand. I took a small log of maple from my wood pile, lit it on fire with a propane torch, blew out the flame, and tossed it in the vertical smoker with the burner off. It smoldered in there for about an hour without adding much heat. The smoke wasn’t as rich and smooth as using soaked chips but it got the job done in a pinch. Best of luck! THANK YOU SO MUCH……my dad eats lox and bagels every morning and I was SO sick of paying $25 per pound. We are on vacation at the farm, the salmon is curing now while I build the smoker. Tomorrow we will have a pound of lox for $10. YEA!! Thanks for visiting the site and YOU ARE WELCOME! How did it turn out? 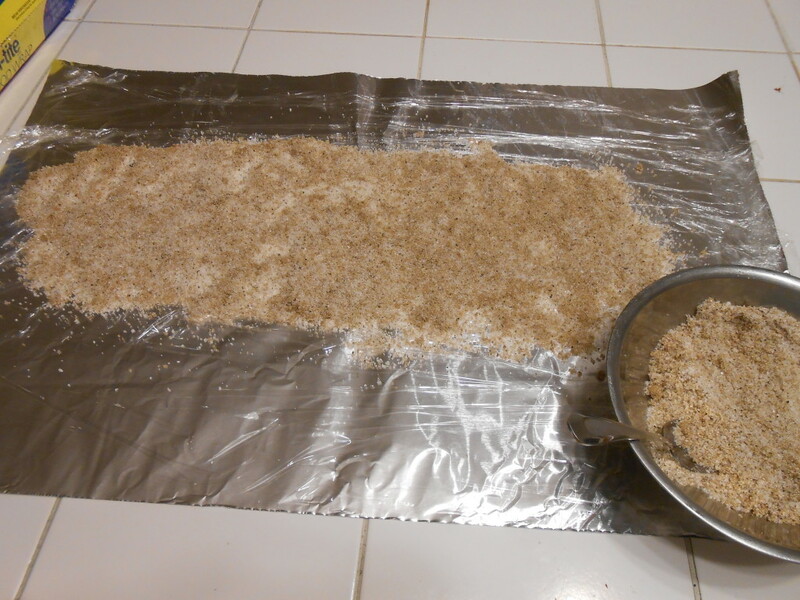 Thank you for visiting the site- this is based on Alton Brown’s method. How did it turn out? Hoping to share more cooking hacks soon. The addition of gin and cracked juniper berries sounds really good! How much and when do you incorporate these ingredients? I would add those ingredients at the start of the curing, along with the sugar and salt. Maybe just a shot of gin or a teaspoon of juniper berries for a side of salmon. They’re both pretty fragrant. OK finished this. I think the cure is good but the cure time was too long. I cured my fillets for 12 hours and they were a little salty for my taste. My filets are thinner than what is illustrated so I am sure that had something to do with it. Next go around, I will go for about 1/2 the cure time. The smoking time is correct. I smoked about 4 hours with alder and thought they could use a little more smoke time. Still much easier than a wet brine for curing. Yes, good point. I’ve found this out too. I used to always use the big thick fillets. Last year I did some with some smaller fillets – like the 1 – 1.5lb ones you can get at most grocery stores, and they do cure a lot quicker. You can chop up the salty ends to make a salmon dip with cream cheese and sour cream.